This note is about moving closer to what’s possible in our Fertile Heart Visionary circles. Closer to becoming a genuine supportive, learning, birthing, supremely fertile community. Is that easy? Is genuine human contact easy? Thankfully it has certainly gotten easier for me through the years, but the ten year old I once was, is not gone. I was ten years old, standing in the middle of the stage reciting a poem. The entire school of several hundred children was gathered in a huge auditorium. Suddenly I froze, went blank, forgot the next line. And the hall erupted in laughter. After what felt like an eternity, a teacher handed me a book and I finished reciting the poem. But for days and weeks afterward, I felt the sting of humiliation with every glance in my directions that appeared to be mocking me. Children can be cruel. That impulse toward cruelty, toward ridicule, and judgment of ourselves and each other, doesn’t vanish. The most powerful judge is the ten year old that sits in the middle of our own hearts, unsure about who she is. Unsure about whether it’s okay for her to be who she is. That ten year old is at the mercy of everyone with an opinion. The first step toward gaining the courage to fully play the human game as a contact sport is to remind ourselves that we’re not ten years old anymore. Creating a space in which we allow ourselves to be who we are, is perhaps the most ambitious an aim for a group of people who seek to co-create a supportive community. I say we can do it. It’s a risk worth taking. It’s what I will keep going for. Because to me, that’s what makes life worth living. Being in relationship with people who can encourage you to keep shedding the masks and move closer and closer to who you are. It’s not something you can buy The same way you can’t “buy” friendship, or healing, or love. All that good stuff comes from having the courage to engage with another human whose heart, just like yours, is teeming with ten year olds. For those of you who are on the Fertile Heart Visionary Calls that means showing up as if you knew how much your presence in our circle matters. It does. You can make a difference in the medicinal power of the space we co-create. To risk being known can for some us be more scary than we’d like to admit. Being able to speak about what it is that makes it so challenging, could help us cross over from hiding to being seen. Take a chance. We don’t need perfection. Just give us what you got right now. We want to get to know you. So that we can all claim the healing power of a genuine community. Being seen is scary. It’s so hard to feel so misunderstood. I am constantly working toward being the best me that I can be. Part of that is to care less about what others think and move toward my best self in a positive, creative and loving way. One of the many things that I have found on this journey so far, is that being me and paying attention to me is absolutely what I need to do. I’ve spent far too long taking care of others, making sure they are fed and have all of their needs met, while ignoring my own. My body and my needs have most often taken a back seat….until now. I actually started this change about 2 years ago and have slowly evolved to make myself the priority. I still struggle at times to make sure I eat when I need to and sleep instead of getting the next thing on the task list done. However, the person who shows up for others now, is a more true me. I like her more and she seems more accepted and well liked too. The thing is that this new person is the real me, I am being seen. The difference is, I am caring for myself first and so when I show up, I am coming from a more kind, gentle and loving place because I’ve already given myself those things. While there will be constant work for me to do in this arena, I am so grateful to have run into your work, Julia. It is affirming the choices I have made and encourages the constant evolution into my best being. Thank you! I was so touched by all your stories. Thank you! I cried quite a few times, it was so healing and I felt a lot of compassion with you all and your journeys. We all have our fascinating (and yes, often difficult) stories to share and energy to put in a good use, but to be honest with you all, I think that I actually didn’t want to fully belong to “this” community–I never saw you in person (not that it is any obstacle, but it was part of my excuse), I thought my pain is so “painful pain” that I have to first “solve” it somehow and ONLY then I can relate (and share and help) others. I haven’t realized that it can actually be through this very process, through this experience that I grow, change and relate to and connect with the world. It is a beautiful thing to expand my circle of compassion to include more (all). Julia has this special talent to activate the good in people. I, for a long time, thought I can’t walk this path alone (well, with “my” husband, “my” family, “my” doctors etc.). Only recently I realized the importance, the beauty, and as Julia puts it, the “medicinal power” of this very special community. For quite some time in my life, I thought I can do it. I can figure it all out myself. I have to, because that is what I was also told: “you have to fight, you should be strong, you should manage (ALL others managed, right, so WE are sure you can manage it too)”. I am happy I found Julia and I am happy I found you all through (thanks to) Julia. It is a very comforting and beautiful feeling to be part of this community that so intensively realizes what a miracle life is. In Woodstock, Julia wrote to “my” book (Fertile Female): here is to miracles! So, here is to miracles! Thank you, Julia. Thank you strong and inspiring mamas! Being in my mid thirties I am only just starting to feel what support a group of people that share a similar desire can provide. As well as what my contribution can be to such a group. In the calls with the others and Julia I often wonder what I can contribute, what “worthwhile” I can bring into the circle. If someone then brings a topic into the circle, may it sound simple at first I notice how helpful this also can be to me. During my upbringing, I have learned that if must be a “nice, umcomplicated” girl, keeping my feelings and need for help to myself. This has affected the way I behave and feel when it comes to the human game. This little orphan is a visionary which is getting born at this phase of my life. We have been trying to conceive a baby for around five years now with some interrupting (change of job, building a house, getting married). It then came as a great surprise to me that conception is not happening when I planed it to happen. 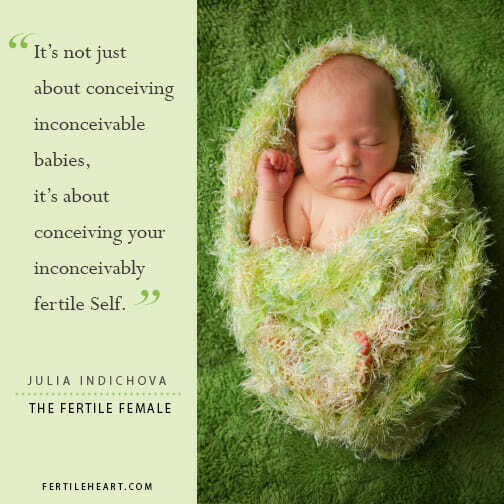 After I failed IUI and one failed IVF cycle end of 2017, I have been really down but only then started to fully take things into my own hands and came across Julia’s work. It has helped me tremendously in seeing the positive sides of this journey. I have changed many things in my life now and have my ups and downs but also feel a great deal stronger than some months ago. Warm, baby dust greetings to all of you. There aren’t enough words to express what this practice and circle means to me. In the last 5 years I have become a stronger, more passionate, more confident me. I do not hide when I’m hurting now and instead reach out for the support and love that I need, at home, with friends, at work and within this circle. Julia is an incredible support to me and I agree, I used to be afraid of letting her down, but really, now, I realize I’m afraid of letting myself down. It is only then that I risk letting Julia down. My focus every day is to absorb and enjoy what is happening right in front of me in that very moment. I treasure every second of the day that I get to spend with my son. I’m a full time working mom so some days those moments are limited. Regardless, I choose to understand how fleeting single moments can be. I cherish every tear, tantrum, battle, smile, giggle, hug and kiss. Seven years ago my very knowledgeable and best in their field doctors told me that what I’m living right now was impossible. I’m not willing to say they were totally wrong. They were interpreting their tests and results as compared to what research has indicated. At that moment in time I was not able to have my own child. What I know now is that I may not have been ready to have my own child because the child within me was screaming for some attention. What I know now is that I needed to show myself some love, compassion, forgiveness and understanding. I needed to parent myself before I could parent my child. Julia helped me see that. Many say my son is a miracle. He is. But isn’t every baby a miracle? Yes, truly each one is a miracle. A friend sent me an email with a link to Fertile Heart and it forever changed my life. After three years of injections, procedures, tests and cycles and cycles of hope, devastation, despair, anger, sadness and then hope again, after 4 failed IUIs, 2 failed IVFs, then 3 failed IVF with egg donor embryos, I finally found a way to firmly grasp onto hope and not let go. I learned how to start taking care of me. I learned this through the FH Practice and the teachings of Julia. I have committed to the practice, every day. No, it is not easy and requires a willingness and desire to dive down deep into who you are, unearth the parts of yourself you don’t want to share with anyone, including yourself, be willing to hear, listen, love and care for those parts of you. My practice has changed who I am as a mom, a wife, a friend, a daughter, a sister and even a professional. I take care of others for a living and my FH practice has taught me compassion, understanding and patience. It has taught me how to interpret and recognize my response to people, situations and how I can best help. I am not the same person I was seven years ago. I’m thankful for that every single day. I work very hard every day to let the two year old in me be heard. I’ve learned that it is far better to let that part of me kick, scream, punch and yell, then breathe, give myself a hug and continue forward than it is to shush it and push it back into a dark corner where no one can see. My practice and my longing to have a child brought me to my son and now I continue every day longing for another child. Today I sit here typing, one day after receiving a negative test result on my pregnancy test. Our last egg donor embryo transfer, five years after we initially began our egg donation cycles and not one resulted in conception. I look into my son’s eyes and remind myself to not let go of hope. He was conceived the old fashioned way. And as the sadness and sorrow fills my heart, again, it aches and longs for another child but I know this is a guidepost on my journey. I know with Julia and the Visionary Mama’s circle I can keep walking toward my second child. Each day, with each imagery and body truth, I heal, I learn and I get closer to my second child. Julia and the Visionary Mama’s give me the courage to continue taking each step, even with a broken heart. Each day is a beautiful day to be alive. And I have always learned more from my struggles than from my successes. All my love and gratitude to each and every one of you…. Until we meet on the bench…. I am there thinking of you even though tonight we cannot be on the call, as we decided to take a romantic week away in Europe, just the two of us. We are thankful for the community on our journey to a baby, it can feel like it’s only we who are struggling sometimes. Julia’s story about being ridiculed for not remembering the poem as a child remind me of me at thirteen singing a Czech folk song in front of a choir. I had passed all the exams in sight reading, intonation, etc and when I was supposed to sing in front of the whole choir, I was singing off key. I was let go from the choir and frankly don’t know if I ever recovered. My friend Blanka was accepted, I still remember the song she chose. After high school graduation, which is called maturita in Czech, I learned that Blanka had a car accident in her first job and died. I have been singing ever since, but this experience marked me. It wasn’t until recently that my husband and I were asked to sing at my brother’s wedding, friend’s wedding, and people have told me I have a beautiful voice. He plays guitar, and has been shy about it. These couple of public performances made it clear that we make wonderful music together, which must in some way translate to making wonderful life. Can I have a wonderful life if Blanka’s life was cut short so soon? Do I deserve a perfect body? A body that has become more round and plush when Nick recovered from cancer and I don’t need to worry about him anymore. Why do I get scared of the power of my own ability to give life? What is so threatening about it? I want to share with you that we recently started celebrating the jewish shabbat, and it brought another dimension to our lives. Nick’s mother Dorothy who passed away last April, was Jewish, but when she married Nick’s father, Frank, his parents didn’t speak with them for five years until Nick was born. They were anti-semitic. They were married in New York in 1959, she wasn’t sure where, but always remembered the piercing look of her mother in law on her shoulder. For my own side of the family, I have reconnected to my grandmother’s little sister, who just turned eighty five in March, and despite my parents’ disapproval, our relationship has flourished. She reminds me of my grandmother so much, her voice, her build, everything. My mother told me that her mother didn’t love her. I say that’s not possible. She just didn’t know how to say it. Just like my mother doesn’t know how to say she loves me. I have come a long way to not be scared of my own mother. How can I relate to anyone, to the world, to my body, my husband, get close to anyone, if I had been scared of my own mother for so long? We have been doing the mirror of truth every day and I have been doing the wailing wall as well. Oh how I wish I could meet you/be with you in person! I SO SO SO treasure the visionary calls, and like Julia wrote in the blog, I wish I could get to know you better. Last week I had an appointment with a “fertility therapist”, and I knew immediately that while she might be a helpful resource, we weren’t on the same vibration. It was very strange, as I had kind of pushed myself to meet her, since I tend to get stuck, and I am trying to build a network of support. It really made me aware (once again) of how deep and sophisticated the OVUM work is, and how I need to find people who ‘get’ it. So THANK YOU ALL! I was very sad to have to miss the last conversation. During the one of the recent previous sessions, sometime after my 43rd birthday, I participated in the call quietly because I couldn’t stop crying. I had fertility labs and testing done, the first time since my daughter was born 4 years ago, and it was not good news. Although I had nonexistent AMH when she was conceived, I had 8 follicles at the time, and my FSH that particular cycle was not elevated, though it had been in the past. Now, I never even bothered finding out my AMH when they told me my FSH was 32 and there was one tiny follicle on each ovary. The RE said, “I’m afraid you may have already had your miracle baby”, which angered me more and more as I heard those words through my sobs. She said that I’m not a candidate for drugs, as they wouldn’t work at all. (I used Femara for my daughter). She also said that menopause is right around the corner– mid forties as opposed to closer to 50. This has been the most difficult I think; I want so much to age gracefully, to inspire others, and to feel grounded and whole. I am SO NOT READY for menopause, I am having another baby!!!!! I imagine all of the beautiful juicy eggs I dropped over the past 30 years, and I imagine all these electric, beautiful babies who could have been…and this is a nasty little needy orphan…always regretting. At first, I turned to my commitment to growth and healing, emboldened by Julia’s books, imagery, and my husband’s positive energy. I had already been reading up on egg donation, which I feel called to more than adoption, but the pain is DEEP! OH LORD! But more recently, I’ve been numb. I don’t feel very positive about conceiving naturally, as I don’t feel like I’m truly ovulating, although so far I’m still having my light periods. I want to be positive!!!! My next steps are to meet with someone– I’m not sure who though– about egg donation, as I admit that I feel excited about it. It’s kind of amazing that this option exists:) . I would love to connect to others exploring this, or who might be farther along the path. I am also open to fertility drugs like hope and inspiration, and always love to read the amazing stories. I plan to be on the call tonight and look forward to connecting. It can be so hard to show up as we truly are, rather than as we would like the world to see us. But Julia creates an extraordinarily safe space in which to do so, and one in which I know that whatever I bring, I will be held with both great compassion and wisdom. I am truly thankful for this. It’s allowed me, over the time I’ve been part of the circle, to trust that I can bring anything onto ‘the bench’ and that I won’t be judged. What a relief! And it is so interesting how often, on a call, someone else brings up something that is almost an exact mirror of how I am feeling that day, too. So there is always much learning and healing happening in the circle. Even though it can be hard to show up as you are, and bring all the orphans to the table, I find it very healing, both when I do and when others around me do too. It makes me realise how often (both in the circle and in the wider expanse of my world) how many others are dealing with often quite similar concerns. And yet, if no-one speaks up, it can be easy to believe the opposite, that you are so very alone and the only person feeling like this, and that can be a lonely place. Social media seems to (mostly) only perpetuate the tendency to show only the shiny glossy stuff. Thank you, Julia, for holding space for us all. We are so lucky to have you! I have been engaged with this community for about the last year of my fertility journey. I feel stronger, emotionally healthier and more conception friendly than I had been. It is for sure a work in progress, but the things I learned through the practice have been invaluable to me. The last Visionary call I attended Julia started out by telling us how much our presence matters. This was such a reassuring sentiment. All I need to do is be myself and be present to benefit from the work. The support of the community means being vulnerable, as well as being in tune with others’ vulnerabilities. Even when you haven’t hopped on the bench for a particular call, you can get so much out of hearing Julia work with others on the bench. MagnumMama – I relate to you when you say you don’t want to let Julia down. The work has framed so much of my thinking that I feel the same way. I want to make sure I’m doing my Body Truth and Imagery in a way that would make you all proud, and in a way that gets to the heart of what I really need to work with at the time. We are pursuing egg donation at this point in our journey and I have been working on Nine Hearts, First Nursery, It’s All Good and Blanket of Reassurance. I wish you all much success! Dear Julia and FH Circle. It is hard to put into words in a small box like this – how much this practice and you all have helped me over the last 2+ years. Helped me grow, explore what’s possible and discover myself. The journey is sure to continue beyond the point of meeting our child half way when it happens. “Courage” – that’s what I am after at the moment. Courage to ask what I want, what I need. I have picked “Learning how to ask” imagery this week. And I said to myself – why not write a comment asking for what I want from this community. So here it goes. Please do your part to let this community thrive. We are very lucky that there’s one Julia in this world and we have found her. There maybe multiple kinds of birthing practices out there or spiritual practices – but let’s commit to this practice with our guide by our side, to whichever extent we can. But let’s please show up as if our presence matters – because I have experienced it , and there’s no doubt that it matters immensely. If there’s any doubt in anyone’s mind – one reading of the “Fertile Female” will be enough to dispel it. God forbid, but I will be heart broken if the Visionary circles were to cease. I notice sometimes women hurt other women, or dislike them, or pass up a chance to support them when it was quite possible for them to do something to help them, while respecting their space. I have done this myself sometimes – subconsciously perhaps. You may say, I am being hard on myself. But I do want to hold myself to the highest standards and learn to be compassionate – of course starting with myself – my body child, my heart and my partner, all of that. And keep learning how to do this, and become a good example for our future children and all those around us. Life is made up of several choices from one moment to the next. Our choices matter – no matter how small the impact may seem in that moment. Let’s multiply our power to help and heal ourselves and each other. Here’s the moment of choice – you can write a comment on this blog expressing how you truly feel and practice being in the current of truth just for a moment. Thank you for this blog Julia, and thank you also, MagnumMama for appreciating the Eye of the Tiger song. I’m glad you are finding it helpful. In most of our interactions with people it is easy to forget how much we as humans have in common and it is also easy to feel alone. Thank you so much, Julia, for this space. That is wonderful, MagnumMama that you are feeling support in your life with family and friends as well. I felt the need to be soothed this week. I have been working with Rock the Baby body truth and Palace of Love and Acceptance (Palace of Truth) Fertile Heart imagery. I have felt some rocky emotions lately and have felt nourished by the practice. I still feel more like a kitten than a tiger. “It takes a village to raise a child” has never been more of an important proverb to me than at this very moment in my life. I have been working with Julia and this beautiful fertile community for almost a year and my life has been changed forever and for the better. With every call that I actively participate with – even sometimes just listening, I learn something from each of you who ‘hop on the bench’ that allows me to search within myself to build a stronger, more vibrant visionary mom. I have made an effort to engage more physically and intimately with my husband so that we are making love to each other on a more frequent basis, not just doing a baby dance. This alone has brought us closer together on this journey. I have been a more active listener to my inner truth about what I need most in order to move clear my head and get out of my own way. This has allowed me to be open with my family (even just to tell them anything!) about my past fertility struggles and have them share with me now the hope of where I am today. I have surrounded myself with local friends who help to nourish my body and soul by providing me with weekly walks, fertility friendly foods and a genuine concern about where me and my hubby are on this journey. 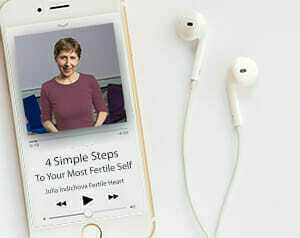 I have reached out to friends to share this work with them and answered questions from anyone referred to me that is somewhere on this fertility path in hopes that I can offer a better way to decide what is best for them. I don’t believe that I would have all of this right now if it wasn’t for you. You encourage me to be a better person for the child that I am going to meet half way. You give me hope that anything is possible once you set your intentions, heart and mind to doing it. You give me strength on days when I feel weak – because even though you don’t know me personally, the last thing I want to do is let you down. I look forward to hearing the voices from the workshop that I attended last year because I am cheering you on every time you are brave enough to take another visionary rooted action, you make me proud. All that I have I experienced from this community has been a gift. The beauty of this gift is that it keeps on giving. You just have to be ready, open and willing to receive and accept it. Sometimes it takes a little work and effort on our part in order to stretch out our arms in order to receive and embrace it. This happens to be part of the process and it is so worth the effort. How else will you be able to wrap your arms around your baby if you aren’t able to embrace all that this community has to offer you in order to get there? We are struggling with infertility for eight years and moving toward adopting. This journey is very challenging for me and my husband. Many times I feel like a failure. Thank you Julia for calling on me on Monday’s call and all the work you did with me. During the imagery we did I cried all throughout it and it was really cathartic. On Tuesday I woke up as though something had lifted up from me. We are doing the imagery and body truth you assigned to us for the next two weeks. Julia we are community based members of Fertile Heart. We thank you very much!